Enlightenment can be defined as: An answer to the question in need, namely a state of Urgent-Valuable Want. For example, you are dying of hunger, someone offers you breads. You are certainly enlightened. Let us offer two spiritual related examples. Here, the stronger the Urgent-Valuable Want, the stronger the State of Enlightenment for that individual. (1) The Lock-Key information crossover onto intellectual knowledge; that is, a scientist is dying for the solution to a problem pertaining to a piece of logic in the universe. Most likely this logic (or all its parts) is already pre-coded in the Vacuum Computer. The pre-coded logic is the Lock. The key is formulated by the scientist’s Ck-5—Ck7, Key into Lock —> Intellectual Knowledge of problem-solution. With this problem-solution after years of brain-spirit (–> mind) searching, the scientist is fully enlightened. (2) The Lock-Key Information onto Energy-Mass perceived by the mind (brain-soul) of a psychic; for example, a psychic is dying to discover certain karmic issues. In this example, Energy-Mass produces psychic visions in the form of a prophecy. In this case, the Lock is the pre-coded logic for this karmic issue. The key is formulated by the psychic’s Ck-5–Ck-6 states pertaining to this karmic Issue. Lock-Key implies executing in attempt to open the lock (notice, the process included key looking and found lock). The is executing the collapse onto the Psychic’s intuitive wisdom. Sageness Within–Kindliness Without–Godliness in Self. Sageness Within and Kingliness Without are the main goals in life as taught by the Chinese Classics. In The Spirit of Chinese Philosophy, Fung Yu-lan has this say. In Matter-Being Paradigm, this world implies the physical world of matter, while other world is the Brain-Soul world of the Information Vacuum and the Brain-Spirit world of the Logic Vacuum. Sageness Within [Ck7–Ck5 –> Intellectual world of the universe] functions in the Brain-Spirit world, while Kingliness Without connects to the manifestation of the Brain-Soul world [Ck-6–Ck5 –> Visual world of the universe]. On the other hand, Godliness in Self manifest [Ck8 in pure love] between the Brain-Spirit world of this universe and other universes. Finally, the last component in the Holon is the Path, as shown in the circuit below. Mis-Communication in Ck-8 = Ck-7 – Ck-6. Ck-1 (formed by three Acu-Point Circuits) is the Holon circuit of the adrenal glands (its Spirit-State). The Soul States is defined by the Information-Energy of the Holon Adrenals–Spinal Column–Kidneys. Within this Holon is the Information-Energy of the Medulla-Chromaffine tissue (<—-> Chong Mai in logic-information). In the words of David V. Tansley. The adrenal medulla, consisting of chromaffine tissue, … is infact an endocrine extension of the autonomic nervous system that controls many body functions automatially. …This tissue arises in the embryo as neuroblasts. These primitive nerve cells migrte along the course of the sympathetic nerves, and are found in special concentrations along the sympathetic nerve chins running along each side of the psin, rather reminiscent of the ida [Ren Mai] and pingala nada [Du Mai] of the Vedic tests. The are also found in all of the major nerve plexii of the body, and are widely distributed throughout the dermis of the skin. The Holon Adrenals–Spinal Column–Kidneys corresponds to the Chong Mai in Information-Energy (the lower diagram) is represented by Ck-1 (the top diagram). 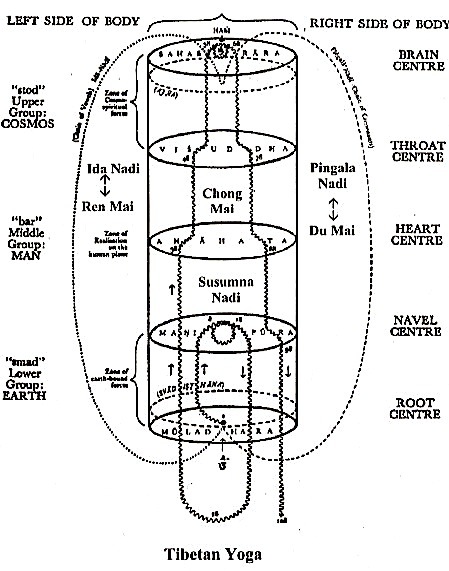 Du Mai (pingala nadis) and Ren Mai (ida nadis) also have their correspondence in the above right diagram. In conclusion, both the left side of the Air–Fire Chakra Circuit that leads to Ck-6 and the bottom Ck-1 — Spinal Column Circuits bring on Kundalini Fire. Only the left-side of the Water–Fire Chakra Circuit can be used for spiritual development leading to Ck-7. 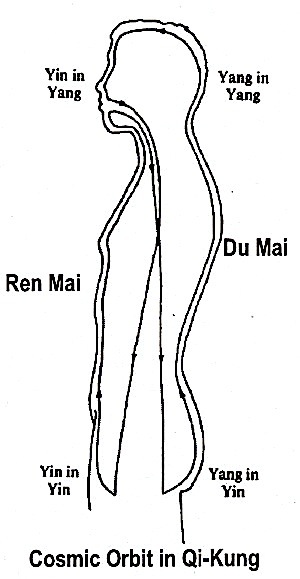 The Du Mai and Ren Mai, further define the Kundalini Circuit according to Qi-Kung practice. This Circuit, referred to as Cosmic Orbit, is shown below. The Ida Nadi and Pingala Nadi, combined with the Susumna Nadi form the Holon Circuit of Kundalini Practice according to Tibetan Yoga. This Circuit is shown below. Therefore, the Chakra Kundalini Circuit contains both Tibetan Yoga Practice and the Qi-Kung Practice, plus the Tantra Yoga Practice as stated in the previous posting. This is the reason why the Chakra Kundalini Circuit is the one used by the Ascended Masters (see posting, QA: What are the Kundalini Paths). In short, the Chakra Path is not only an integrated path; but also a path that minimize the complexities in spiritual development, especially with the WebHealth Computer. The highest state of enlightenment in the illustrated Chakra Path is the combined optimum transitional paths: (1) from the logic-information of the Acu-Point Circuits to the Information-Energy Path defined by the Chakra, and (2) the collapse of the Information-Energy onto the Energy-Mass of the physiological chemistry for the individual. Although, the WebHealth / Acu-Brain have never been used for spiritual development, specially on the Chakra Kundalini Circuit. Yet, every elements and groups of elements shown in the Circuit were successfully diagnosed / treated with the WebHealth Computer in the perspective of health-evaluation–healing. Diagnostic has to do with pin-pointing body-mind mis-communications. Remedies include Herbs, Acu-Points, Homeopathic, and Exercises. Thus, this pin-pointing diagnostic-healing ability of the WebHealth Computer could be used to assist spiritual development. Thus, the complexity in spiritual development could be much simpler with the help of the WebHealth Computer. After learning the symptom-feeling on your own through the pin-pointed physiological causal path determined by the WebHealth Computer, one can diagnose-heal without the use of the computer. In this case, one’s depends on ones own psychic symptom-feeling. This symptom-feeling technique has been successfully used by my wife and me for years without any difficulties. There is an exception, namely in cases of illnesses, the symptom-feeling goes into a transit mode. The symptom-feeling within a transit mode can be opposite to normal. Here, the WebHealth Computer is needed for accuracy. Meditation, according to the Matter-Being Paradigm, is defined as follows: (1) Lock-Key pin-pointed with the Intellectual Knowledge of the pre-coded Logic-Information, (2) Via Intuitive Vision / Wisdom by executing the Information crossover onto Information-Energy in this pin-pointed activity, and (3) Collapsing this pin-pointed Information-Energy onto Energy-Mass in the form physiological-chemistry. Meditation mostly involves either (1) or (2). With (1), it connects with Information Healing as described by the WebHealh Computer. With Two, it becomes Energy Healing also described in the WebHealth Computer. At present, (3) has not yet been developed in the WebHealth Program. The key difference in this definition as compare to other definitions is: with a purpose, namely the pin-pointed where (specific location in the sense of anatomy), what (specific physiology), and how (tonify or sedate). The ten Acu-Points / Tree of Life Mandala is described in the posting: WebHealth and the Acu-Brain. The pin-pointed Acu-Points and / or Circuits needed to be healed are also put into the Tree of Life, within the 22 paths that connect the 10 Acu-Brain Points. These two sets of Acu-Points are commanded by Brain-Spirit for Information Healing and / or Brain-Soul for Energy Healing. These 22 paths also correspond to the 22 paths of the I-Ching, namely 10 celestial stems and 12 branches. (Ck-7–Ck-5) –> Intellectual Knowledge of the Universe’s Creation, (Ck-6–Ck-5) –> Visual-Knowledge of the Universe’s Creation. Therefore, scientist’s lock-key search [Ck-7–Ck-5] resides in the Water-Fire Circuit and has less of a chance to cause Kundalini Fire as compared to a Psychic’s lock-key vision [Ck-6–Ck-5]. The Acu-Brain is important because there are pin-pointed cases in which remedies are either not available or not yet known. In short, the Acu-Brain is the “Logic Brain” behind Brain-Spirit.